Well that’s it. I’ve been up to Downpatrick and Down Royal, across to Galway and Ballinrobe, down to Tramore and Wexford and now over to Tralee. 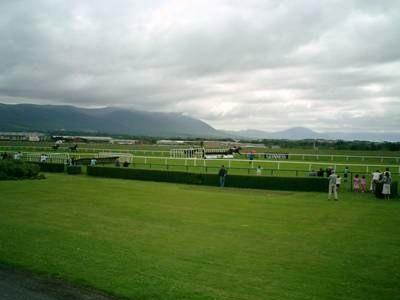 All twenty-seven racecourses visited – not including a visit to the now closed Phoenix Park. I met up with racing pal Adrian at Cork airport and we drove the 80+ miles west to Tralee.This takes the best part of two hours as we are not talking motorways. On arrival in Tralee we split to our respective B&Bs, both in Oakpark Road, just a short walk from the town centre. I was given a very small single room dominated by a large double bed. As there was no room to stand, I sat on the bed and stared out of the window Hopperesque style, contemplating the action ahead. Time for dinner. During our previous stay in Tralee (en-route to Listowel – see 1996 article) we ate in town at Larkin’s. This was when Adrian was given the opportunity to preview his dinner – a live lobster dancing around on a beer tray. Larkin’s had changed hands and was now blandly called the “Bistro”. When the proprietor told us that there had been a lot of changes she wasn’t wrong. We had to wait over an hour before eating anything and the Guinness was off. Definitely off the list. A few pints followed in some of the town’s thirty pubs. As we approached our first, I noticed two lads smoking at the entrance and braced myself for the inevitable smoky atmosphere inside. But of course there was no smoky atmosphere. What a revelation. All public enclosed areas are now smoke free - pubs, restaurants and even betting shops. An amazing transformation and having experienced how successful it’s been I am absolutely certain the policy will soon be introduced here. On to the racing and the three-day meeting at Tralee – or Ballybeggan as the locals refer to it. Sunday and Monday (b/h) afternoons and Tuesday evening. The only other time they race is the four-day meeting at the end of August as part of the famous Rose of Tralee festival. On arrival for the 2.15pm opener, the crowd was not looking great. Attendances would in fact get smaller culminating in a tiny crowd on Tuesday night. This was a shame, as I am sure you are aware the course has had its share of problems, nearly closing over the winter months. Eight races to enjoy, a mixture of flat and jumps. Unimaginatively, the first four were all over the one-mile trip. If this wasn’t enough betting fodder we also had the chance to play seven races at Gowran Park. Despite this intensity we both managed a winning day. A couple of winners at Tralee including Shaykhan 10/1 winner of a seventeen-runner handicap (over a mile of course), which paid 26.20 on the tote. And some success at Gowran too, Adrian highlighting the chances of the Cathy Gannon ridden Carlesimo, 14.70 on the tote returned 8/1. The most amazing race of the day was the three-runner novice hurdle where the bookmakers bet 4/11, 9/4 and 14/1.The tote “will pays” were 1/10 and 10/1 twice. So there were clear “arb” opportunities as you could bet to around 89%! We played the second favourite at 10/1 on the tote, 9/4 in the ring. The favourite won, but we had had the value. The evening’s eats were at The Tankard just a few miles away in Fenit. The Egon Ronay guide says to look out for the distinctive yellow building. Haven’t you noticed though that every other rural house in Ireland is painted yellow? Great seafood place. Wild smoked salmon starter followed by scallops served with Clonakilty black pudding. Strongly recommended. Back into town and a new pub discovered – Sean Go’s. Excellent duo playing in the bar: guitarist/singer accompanied by accordion. The latter sounded more French than Irish to my untrained ear. The repertoire sounded promising with several Van Morrison and Bob Dylan numbers. No “Wild Rover” or “ Dirty Old Town ” here. After a few more drinks I made a request for a Jimmy McCarthy song. Who? I hear you ask. Well, he is probably best known for penning “Ride On” made popular by Christy Moore. Mary Black has also recorded his songs. The singer asked me which one would I like – which was promising – so I just said play whatever you fancy. They proceeded to play three in a row. If you want to know more I recommend the album “Songs Of The Singing Horseman”, which incidentally has a Jack Yeats painting on the cover. The pubs seemed to stay open until 4am every night but midnight is usually late enough for us oldies! More afternoon action on Monday with a seven race card starting at 2.45pm, supplemented by punting action from Naas. The Tralee card was all jumps apart from the Bumper. Off to a flying start when Murrurundi snatched a win in the opener. I am sure you would have got something like 50s on Betfair as they turned into the straight, our selection collaring the favourite at the last. A juicy 13.50 for the 9/1 shot. Ruby Walsh did the business on the favourites in the next two, which was no good to us, landing a treble with the winner of the fifth. It was all a bit pear-shaped after the first but fortunately we managed to back a couple at Naas to finish just slightly behind on the day. More seafood to enjoy in the evening with a trip to the Oyster Tavern, just outside Tralee on the Fenit road. Nice table by the window looking out to the sea, the mountains and the smokers who were not allowed inside. This turned out to be the meal of the week. Tiger prawns & Thai chilli sauce served on a bed of egg noodles to start and then the chef’s special – Turbot – absolutely brilliant. A later start to the races on Tuesday, eight races staged between 4.25pm and 7.55pm.Time to take a trip out of town, therefore, over to Dingle some thirty miles away. Leave yourself an hour to make this trip as it’s a very windy road – go the scenic route though, it won’t take any longer than the main road and it’s a lot more atmospheric, as the road becomes a very narrow pass – Connor’s Pass - through the mountains. In fact it was raining and foggy when we were up there but not at sea level. Dingle is famous for restaurants and we found an excellent one right on the waterfront. This looked like no more than a blue shed - it was called Out Of The Blue – a good name for a seafood restaurant don’t you think? Some marvellous monkfish, the best I had tasted for a long time, washed down with a large glass of a rather good house wine. Before we knew it was time to get back for our 4.25pm start. The track was almost empty when we arrived – I wouldn’t be surprised if they had to switch back to a two-day meeting next year. The punting wasn’t too clever either. We were nowhere near in the first three but painfully close in the fourth. In the latter it was Glencaly, nicely drawn six of eighteen on the inside in the 7f handicap. He stormed up the fence to finish second at a huge price. Four losing races and a rethink required. The first at Chester was about to get underway, so we hit the Ladbrokes on-course shop. There were more people in here than out on the course. You’ll all know about the draw at Chester – in fact the low numbers are often over bet. A quick analysis of the 5f 6.20pm Maiden Stakes: favourite 8/13 in box four, a 16/1 shot in the favoured one box and complete no hopers drawn two and three. I played the traps 4-1 forecast and a single on the one-dog. Dorn Dancer prevailed from the one box at 16/1 (favourite second) bringing me a change of fortune. Slightly mug punterish, I decided to play the one-trap in the next – a 7f handicap and happily a 15/2 winner. Playing up my good fortune saw the one-trap oblige again in the third with an all the way win in the 1m 2.5f race - a 5/1 winner. The fourth race saw the sequence come to an end, so I cut and ran. It’s equine roulette but unlike Portman Park the wheel’s not balanced. The remainder of the Tralee card produced no winners, so the triple one-trap result at Chester more than saved the day. Another night out in Tralee , with a visit to Branagan’s in the centre, a big music pub serving a very decent pint of Guinness. Back to the UK next morning, but as Adrian had a morning flight from Cork, I spent the afternoon in nearby Kinsale as I awaited my early evening flight. It was very productive time, from a betting perspective, owing to that day’s publication of the Euro 2004 Racing Post supplement. Five hours of tranquil study on or near the quay produced five ante-post bets, including the Sweden-Denmark group forecast at 25/1 with Hills and 11/2 Rooney to be top England scorer with Skybet. A great way to end the milestone holiday.